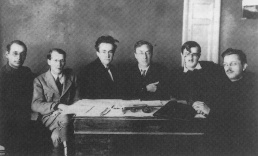 Wassily Kandinsky (third from right) and other members of the INKhUK, Moscow, c1920. Institut Khudozhestvennoy Kultury (INKhUK) (Институт Художественной Культуры; Institute of Artistic Culture, 1920–24) was an artistic organisation, a society of painters, graphic artists, sculptors, architects, and art scholars. The institute was set up in Moscow in March 1920 as a section of IZO Narkompros (the Department of Visual Arts of the People’s Commissariat for Education) to determine the course of artistic experiment in post-Revolutionary Russia. INKhUK had its own regulations and program. INKhUK repeatedly changed its general orientation, organisational structure, membership, and leadership. It maintained close ties with a number of other creative, educational, and research organizations, such as the VkHUTEMAS and LEF. INKhUK was a discussion club and theoretical center. Its first director was Kandinsky. Further sections were formed in Petrograd under Tatlin and in Vitebsk under Malevich. The program of INKhUK was initially influenced by the leftist trends in art (for example, abstract art). In accordance with Kandinsky’s program of 1920, artists affiliated with INKhUK studied the formal devices in various types of art (for example, music, painting, and sculpture) and the uniqueness of their influence upon the viewer. In 1921, the LEF program was developed in INKhUK, and attention was focused upon finding a theoretical solution to the problems of constructivism and production art. Under the auspices of INKhUK, experimental work in artistic design was conducted, and educational programs were organized at VkHUTEMAS. Among the artists active in INKhUK were B. I. Arvatov, A. V. Babichev, Brik, Lissitzky, Popova, Rodchenko, and Stepanova. 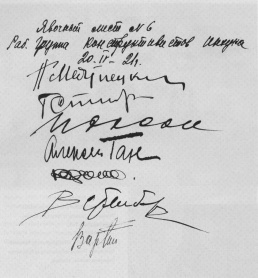 Signatures of the Working Group of Constructivists of the INKhUK (meeting of 20 April 1921): Medunetsky, G. Stenberg, Ioganson, Gan, Rodchenko, V. Stenberg, Stepanova. Parallel and in reaction to these the First Working Group of Constructivists [Рабочая группа конструктивистов ИНХУКа] had formed with its first official meeting on 18 March 1921. The group included five creators of "spatial constructions"--Rodchenko, Ioganson, Medunetsky, Stenberg brothers--joined by Stepanova and, from outside the Inkhuk, the cultural agitator Gan. The five constructors participated in the now renowned Second Spring Exhibition of OBMOKhU in May-June 1921. During their affiliation with INKhUK the leaders of the two most important schools of Soviet architecture in the 1920s, Nikolai Ladovsky and Alexander Vesnin, advanced their views on art. In addition, the first working groups were organized in INKhUK, which later became the Association of New Architects (ASNOVA) and the Organization of Contemporary Architects (OSA). In 1923, an institute similar in character was organized in Leningrad, the State Institute of Artistic Culture (Ginkhuk). In 1923 the work in the Institute began to stagnate. During 1923 and 1924 the institute experienced a lack of public support and gradually disintegrated. After its closure, the archive of INKhUK passed to a sculptor who played a vital role in its daily operations--Aleksei Babichev--from whose widow, Natal'ia Babicheva, it was eventually acquired by the Greco-Russian collector George Costakis (Georgii Kostaki) before his emigration to Greece in 1978, where it is now preserved in the State Museum of Contemporary Art in Thessaloniki. Below is a selective list of documents produced by the working group. Three of them were made during its first three formal meetings at Inkhuk, on 18 Mar, 28 Mar and 1 Apr 1921. These were printed in Khan-Magomedov's books (Russian versions in 2003, English translations in 1986). The fourth document is a slightly modified version of the program produced on third meeting, published in the journal Ermitazh in Aug 1922. The last one is a version printed in Hungarian in Viennese journal Egység in 1922 which differs slightly from the one in Ermitazh. ↑ Khan-Magomedov 1986: 289. Khan-Magomedov 1996 dates their first organisational meeting to 23 February. This page has been accessed 21,620 times.